Approximately 130 street lights help provide light and security for the four neighborhoods within the Colorado Centre Community. Additionally, 8 larger lights illuminate the major street intersections and the Parkview Park. When a new residential subdivision is built in the District, the developer pays for and installs the street lights within that subdivision. 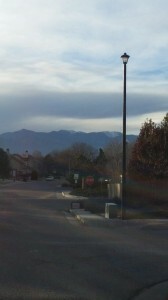 Colorado Centre Metropolitan District then executes a street light lease agreement with Mountain View Electric to provide electricity and maintenance in exchange for a monthly street light lease fee. The District’s street light program is funded through street light service charges collected from Colorado Centre Metro District’s commercial, residential and builder customers. The residential street light service charge is $2.40 per month/per account. In 2017, the District paid Mountain View Electric $2,552/month for the accumulative street light leases. The District pays Mountain View Electric a flat monthly rate for each street light regardless if the light is operational or malfunctioning. The District encourages all residents to report malfunctioning lights or outages to the District office at (719) 390-7000, extension 11 or to the Mountain View Electric Office at (719) 495-2283 or the online link below.